Take a look at the bookshelf of any poker player and you will find various books on poker, some good and some that probably should be burned. For those of you new to the game and wanting some quality poker material to read, check out our picks for the best poker books on the market. Known as the “poker bible,” Super System was the most innovative source on the game when it was first released back in 1978. Doyle Brunson wrote the chapters on Texas Hold’em with legends of the game writing the other chapters. 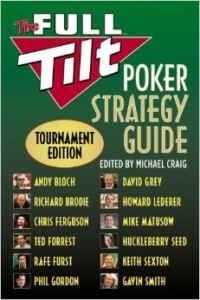 Fast forward to 2004 and Doyle decided to revamp the book with a new generation of pros covering the non-Hold’em games. Daniel Negreanu covered 2-7 Triple Draw, Jennifer Harman covered Limit Hold’em, Bobby Baldwin covered Omaha Hi-Lo and son Todd Brunson covered Stud Hi-Lo. 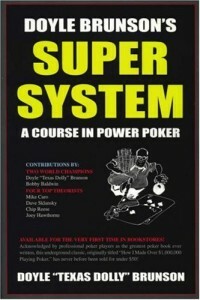 Super System is still a great read for those wanting to brush up on non-Hold’em games. Some of the Hold’em information is outdated but you can still learn a lot about game psychology, aggression and other intangible concepts of the game. Dan Harrington is the 1995 WSOP Main Event champion and made the final table at both the 2003 and 2004 Main Event. 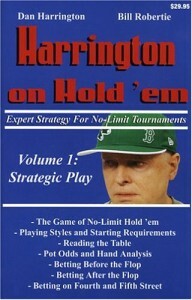 Following his 2004 run, Harrington released a series of books entitled Harrington on Hold’em. The first series of three books covers tournament play. Harrington introduces advanced concepts such as calculating your M in a tournament and walks you through live play scenarios. These books are still considered the quintessential books on tournament poker for many players. It covers many intermediate and advanced concepts of tournament player with complete examples that will prepare you to be a successful tournament player. Harrington also released a second yet less popular series of books on cash games that are viewed equally as useful but his tournament books are easily the most insightful. Prior to the 1987 release of The Theory of Poker by David Sklansky, many of the concepts we take for granted today were fresh ideas. Concepts such as pot odds, implied pot odds, semi-bluffing and others weren’t part of the poker lexicon. Sklansky helped players to expand their thinking on the game and helped them become better players. Sklansky focused on helping players to think poker as a long-term endeavor, not just a short-term expectation. He helped players make the correct statistical and mathematical decisions that will guarantee profits over time. While some would think that this book would be dated due to a 1987 release, it covers many basic concepts that most modern poker strategy is based on. It is still a viable read for anyone new to the game. The Theory of Poker is one of PartyPoker.com’s top poker books of all-time. 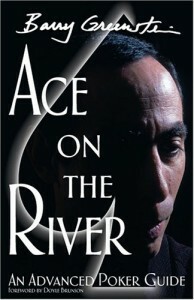 Ace on the River is part strategy book and part biography of the legendary Barry Greenstein. Unlike many other books released during the early Poker Boom, Greenstein bankrolled the release of this book and took his own creative liberties in its creation. Greenstein became famous shortly after the poker boom began because he pledged to donate all of his poker winnings to charity. He later had to change his strategy once tournament poker became a way of life for many pros. In all honesty, this book is somewhat lacking as a strategic reference. Where it excels is the retelling of Greenstein’s rise into the poker world and his discussions on many controversial issues of the game. This book is really more of a lifestyle book than a poker tutorial. 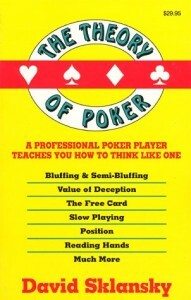 If you want to learn to play better poker, this isn’t a book for you. However, if you want to learn to become a better poker pro and person, this is a must-read. Following the events of Black Friday, one would think that anything Full Tilt should be shunned by the poker world. When it comes to poker books, the Full Tilt Poker Strategy Guide is a great read for anyone looking to become a well-rounded poker. Over a dozen former Full Tilt pros contributed to this book and cover nearly every form of poker that you would find spread online and in live casinos. The value of this book comes from the diversity of strategies available and the insight provided into non-Hold’em games. If you are looking to become more than just a Hold’em monkey, then this is a must-read.